When you look at a supplement to determine quality, do you know what you’re looking for? We have compiled a few key things that separate quality supplements from the products that are not effective and may actually harm you over time. In order to increase the absorption rate and therefore the usability of our minerals, Dynamite uses Mother Nature’s natural process called chelation (pronounced Key-Lay’-Shun). Chelation literally means “claw” and in chemistry it means to firmly bind a metal Ion (a mineral) with an organic molecule to form a ring structure. The resulting ring has a huge effect on the usability of the mineral. Chelation not only protects the mineral from entering into unwanted chemical reactions, it is required for the movement of minerals across the intestinal wall. In fact, minerals naturally exert most or all of their biological effects while in the chelated state! Most consumers, and surprisingly many supplement manufacturers, are under the impression that a mineral is a mineral, and that one form is as good as another. However, research has shown inorganic mineral salts are not readily absorbed by our tissues. While small amounts of inorganic minerals can serve as buffers and catalysts, large doses of undigested mineral salts can actually be harmful to the liver and kidneys. In spite of this, the majority of supplement manufacturers still utilize inorganic mineral salts as their primary source in their formulas. This is because regulators are concerned with monitoring the quantity of minerals contained in a product NOT the quantity absorbed by our bodies. Dynamite supplements contain mineral forms that closely duplicate the natural chelation process which occurs in nature. This means the mineral is body-ready. Inorganic materials (and poorly made chelates) are large partials that cannot easily pass through the intestinal wall. Dynamite’s chelated minerals have molecular weights small enough to easily be absorbed. Additionally, the process of chelation results in the final mineral compound becoming neutral (no electrical charge). This is important because electrically charged mineral compounds are reactive and can deactivate other important nutrient factors, such as Vitamin E, Ascorbic acid, various B- vitamins, and certain medications. Ester-C (a PH neutral form of vitamin C that contains naturally occurring metabolites that activate the vitamin C molecules making it easier for the body to transport them from cell to cell for numerous health benefits). Nearly every supplement in the country uses chemical flow and anti-caking agents such as silicon dioxide, magnesium stearate, and others. These chemicals interrupt reactions with water so the supplement is easier to encapsulate. The problem with using these excipients, aside from the chemical toxicity, is that nutrients need to react with water to be absorbed and utilized. Therefore, chemical flow agents work against the effectiveness of the supplement. Every element in nutrition is interrelated with the other elements, and therefore must be supplied in the correct balance with each other. It can actually be harmful to use or feed a supplement that is out of balance. At best, the ingredients will be ineffectively used, and at worst a major deficiency or imbalance could be created. Every Dynamite product has undergone scrutinizing research and formulation in order to ensure proper amounts and balances for each element. Balance is crucial and can easily be upset, so you should caution your customers against using or feeding another supplement along with Dynamite products unless it has been determined to be necessary for the therapeutic reasons. Many people are of the opinion that “more is better” but this is usually not the case. In fact, many nutritional elements are synergistic, which means that their combined effect is much greater than either would have alone. 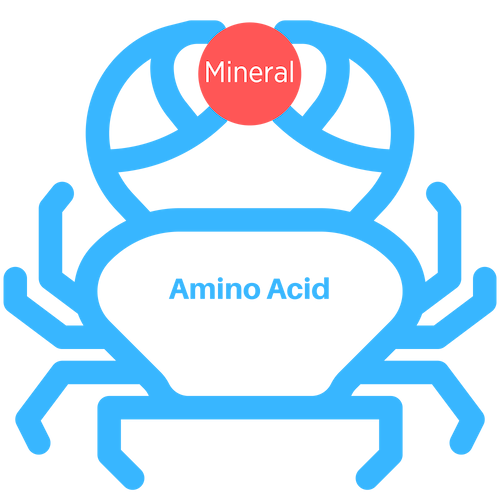 Chelates consist of an amino acid “claw” that is holding a mineral in a chemical bond. A chelate that is stable requires at least five bonds which from a ring. X-ray diffraction indicating the angle of the bonds between the atoms composing the chelated molecule shows that Dynamite’s chelate is a five ring structure. The mineral must be bonded in the chelate ring by two of the elements of the organic molecule. Photoelectron spectroscopic analysis indicates the mineral is bonded to the oxygen and nitrogen in the chelated ring formed by the process. In order to have a true chelate, one of the bonds between the mineral and the organic molecule must be covalent coming from an amino group (NH2), while the other bond is ionic coming from the carboxyl group (COOH). In the Dynamite chelate, infrared spectrometric analysis indicates that the bond between the nitrogen and the mineral is covalent and the bond between the oxygen and mineral is ionic. A chelate that has a larger molecular weight must be broken down prior to absorption, thus destroying the purpose of the chelate. In order to penetrate the body cell membranes as an intact chelate, the chelate must have a molecular wright less than 1500 microns. Dynamite chelates have a molecular weight of less than 1000.